Saves the Day approached their 9threcord as a story of their career so far. Not only is 9the 9thinstallment in the band’s discography but it’s aptly made up of 9 tracks. However, I find that this record is completely based and meant to be interpreted through their closing track ‘29’. The song plays out at over 21 minutes and makes up half the run time of the whole album. The first 8 songs are honestly pretty disappointing as you weed through some corny and immature songs yearning for the old glory days of touring in their youth. It wasn’t until I got to the last track where I understood the record. I see the first 8 songs as nothing more than Saves the Day’s attempt at re-entering who they were at each stage of their careers. Re-listening back, I noticed a parallel between each of the first 8 songs with each of their respective previous albums. Thus, making the closing track, ‘29’ the “actual” 9thSaves the Day record. Which makes sense, considering the length of the closing track could easily be an album in and of itself. 29plays out, both lyrically and thematically, in a much more progressive and aged manner. It talks on the same things as the first 8 songs, but with a certain wisdom that’s found completely lacking in the other songs. Could this be like a surreal, meta way of Chris looking back and talking to his former self? Who knows. But 29 is exactly what any Saves the Day fan would have expected from them at this point in their career. No pun intended, ‘29’ saved this record. Citizen released Open Your Heart this week which was a B-Side from their album As You Please, released late last year. The song opens with the whole band in together as Mat contradicts the rest of the band with somber vocals over rapidly pulsing guitars and firmly snapping drums. Open Your Heart takes a few different musical directions where Citizen freely experiments with different tones and instruments. Sonically, the song is orchestrated into two unique halves and it’s hard to imagine why this didn’t make the final cut for As You Please. The only reason I would think is because they knew that this song needed special attention and promotion. This is a real special one to be added to Citizen’s discography. Thom Yorke, the lead of Radiohead, takes his first stab at a soundtrack with the remake of the 1977 film Suspiria. The original soundtrack was made by the progressive rock band, Goblin. Goblin gave Suspiriaa constantly sinister mood but continued to incorporate their rock roots within it. With Thom Yorke, he takes a complete 180-degree approach to the soundtrack and provides the same sinister themes, but with a much more minimalistic and somber approach. Spanning close to 90 minutes, Yorke experiments with eerie synthesizers, experimental dark jazz breaks, and even provides the soundtrack with some songs that could easily be placed into any part of Radiohead’s discography. ‘Has Ended’ definitely being a highlight for me on there. There’s a flow that continues from song to song and tells a story within itself. Without having seen the new Suspiriayet, I’m still able to sit there and be taken into a world solely through the use of sound. Makaya McCraven is a jazz drummer who’s redefining the meaning of modern jazz. With hip-hop influence sprinkled throughout, McCraven takes an interesting approach to producing music. Like his previous albums, Universal Beings was recorded spontaneously in sessions with different artists before being digitally re-structured and sampled by McCraven into what we hear on the final album. While a lot of McCraven’s influence clearly comes from jazz music, it might be a stretch to even include his music in the jazz genre. His experimentation is so fluid and natural that it would be impossible to attempt to define whatever genre he does fit into. The 4 sessions included on the album were recorded in New York, LA, Chicago, and London and each have their own unique set of qualities that portray both the hearts of those recording, but those of the cities they’re in as well. 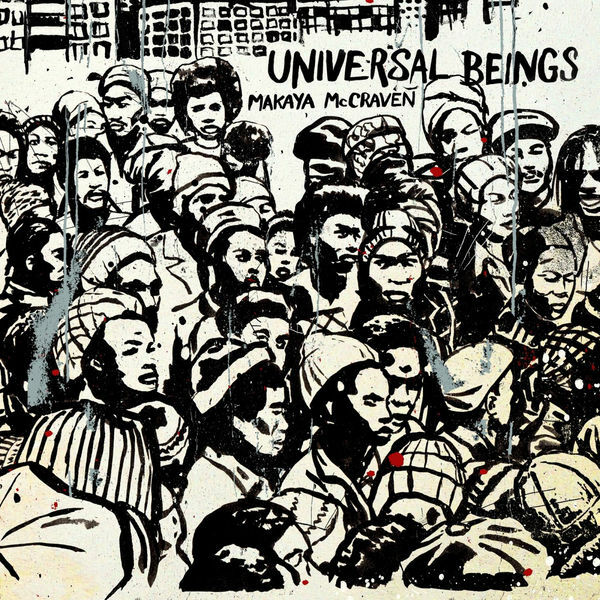 Universal Beings is just that, a universal embodiment of music curated by the talent mind of Makaya McCraven.